Magic 2014: Duels of the Planeswalkers finally introduces deck building. 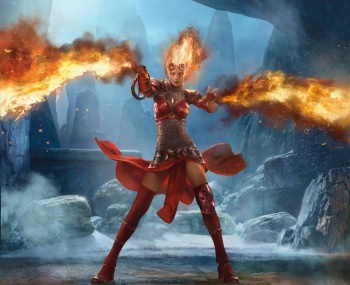 Duels of the Planeswalkers has been around for a few years now, and each year, they seem to manage to top the previous installment in some fashion. Last year, they introduced manual mana tapping, which was a boon for veteran players. The year before was Archenemy mode, which was a great diversion from the standard fare of the game. This year, with Magic 2014: Duels of the Planeswalkers, they've really outdone themselves with the Sealed Deck format built into the game. If you've been playing Duels, you probably know that until now, there had never been true deck building. Sure, you could unlock cards for your existing decks, but you never had the option to assemble your own deck from scratch. That's all going to change with your personal Sealed Pool in Duels 2014. For the uninitiated, Sealed Deck gives you six booster packs, each containing 15 random cards (In Duels they are legitimately random, but they are pulled from only 151 different spells) which you use to build out a deck. If you pull a lot of powerful Green spells, you'll probably want to build around that, but the option is there to build whatever you want from your pool. You can take your Sealed Deck through a special Sealed Campaign mode, or take it online to duel other players and their creations. This is truly novel for the series, and will add a ton of extra hours to the already robust offerings of the game. For newer players, they've even got AI to build your deck for you. You can add cards that you definitely want to play with, and just let the computer do the rest of the work, or you can just have the computer decide what your deck is going to be entirely. While you are restricted to opening a single sealed pool with the base game, you will have the option to purchase additional pool slots via microtransaction. Microtransactions are nothing new for Duels, and this particular option seems important to keep people from simply opening sealed pools until they get what they're looking for. As with previous installments, the base game will come with ten decks to play with, which you'll unlock throughout the campaign. It appeared that there was still a heavy focus on mono-colored decks, with seven of the ten being single-colored, but they are bringing some solid variety with a Blue and Black deck, a Black, Red, and Green deck, and a Red, White, and Green Sliver deck. Oh, yeah, there's a Sliver deck, chock full of M14's latest addition to the sliver family. This is probably only exciting for a small subsection of the players out there, but it is really exciting for them. Slivers are a hive mind, and each sliver offers an ability or power and toughness boost for each other sliver you control. For example, one sliver might give all slivers you control the First Strike ability, and another might give them +1/+1 - a boost to each of their stats. With that kind of exponential growth, and just a few Slivers on the field, your army can be very hard to deal with. The campaign mode in Duels 2014 actually tells a story this time around, rather than just being a series of duels. The focus is on Chandra Nalaar, who is hunting down an enemy planeswalker named Ramaz with the help of her friends. Each area of the campaign is a different plane, from Innistrad to Zendikar to Ravnica. Each plane will feature decks based on the themes of the plane, so you can expect to encounter a zombie deck in Innistrad, for example. As you play through the story, you'll unlock videos for a gallery, which will tell you what's happening with Chandra and company. To help you get a feel for the Planeswalker team, there's even a Planeswalker Gallery, which offers bios and art from each Planeswalker's various incarnations. As they've done in the past, purchasing Duels 2014 will net you a code which you can redeem for a 6-card booster pack at your local hobby shop. These packs will each feature a special alternate-art foil rare from the game. It was not clear whether they were from the Core Set due out in July, but I would hazard a guess that they are, meaning that they'll be playable in Standard format for over a year. Likewise, with the tie in with the Core Set, there are over 50 cards from the unreleased Core Set, Magic 2014 included in Duels 2014. I expect that they'll all have been spoiled by the time Duels hits, but it will at least give you an opportunity to play with them before the Core Set release. I've played every Duels of the Planeswalkers game released thus far to completion, and I'm still excited about this release. If you have even a passing interest in Magic: the Gathering, you should definitely keep an eye out for Duels 2014 in the coming weeks. Magic 2014: Duels of the Planeswalkers is due in late June for virtually every platform imaginable, including PC, XBLA, PSN, iOS, and Android Tablets, and the best part is that it'll only set you back $9.99.